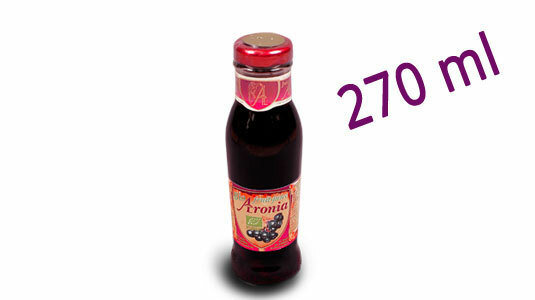 The 100% pure juice from Aronia fruit (Aronia melanocarpa) is produced exclusively from selected fresh and healthy fruits, grown in ecologically clean area - on the blessed land of the Kapinovski Monastery ``St. Nicholas Chudotvorets`` in Central Stara Planina mountain. Juice is produced by special technology – by cold pressing and pasteurization, which helps to preserve the rich biochemical composition of the fruit in the final product. SUGAR FREE! NO ADDITIVES! WITHOUT PRESERVATIVES! Processing is carried out immediately after harvest in a single small series. 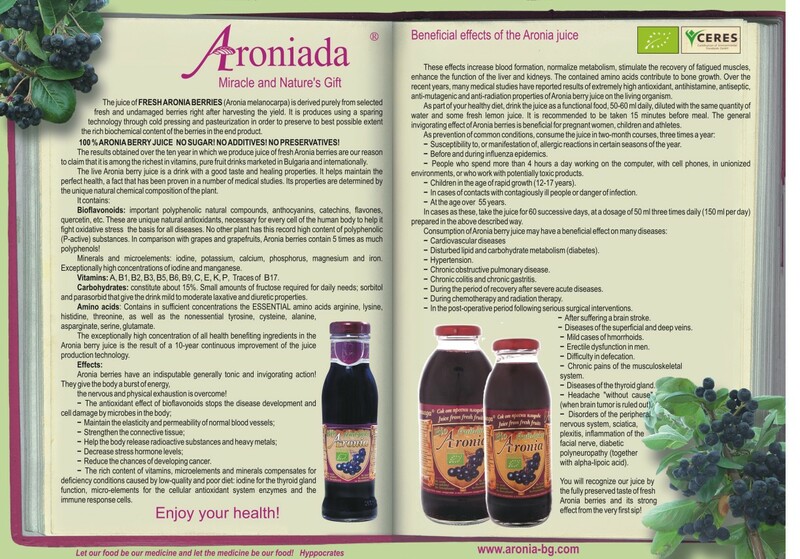 By using non-standard production technology, we were able to keep the juice high values ​​of the vital anthocyanins, catechins and flavonols, vitamin C, B1, B2, PP and others. 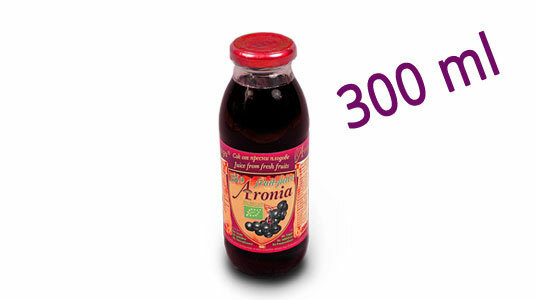 The results obtained during the years of the production of fruit juice from chokeberry give us reason to say that this is one of the most high vitaminous fruit drinks offered on the Bulgarian and International market. The high content of vitamins surprise even experts in the industry! 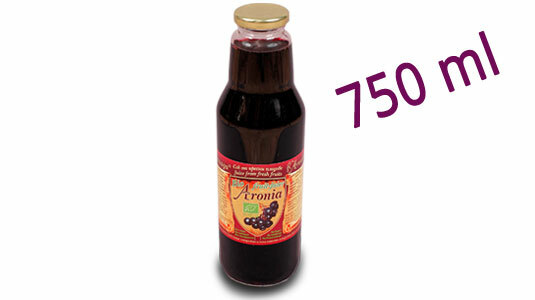 A longtime producers of the fruit with surprise found fully preserved flavor and fruity taste in the juice of chokeberry. 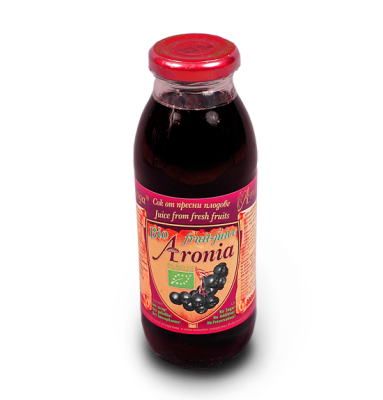 This product – juice entirely from aronia fruit is not only a refreshing beverage,it is and liquid food complete with proven healing properties. Our customers have already found it – try it and see for yourself! 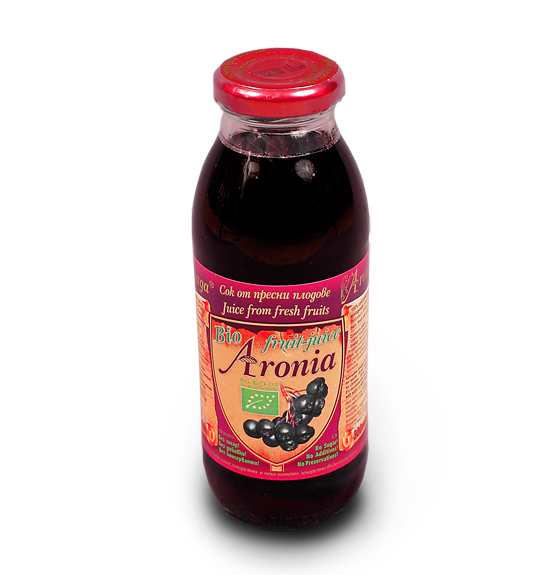 Because different individual sensitivity and to avoid Herxheimer reaction (reaction to rapidly release large amounts of toxins, sometimes accompanied by nausea and diarrhea) Aronia juice is to be used in pure form to 50ml of one dose. 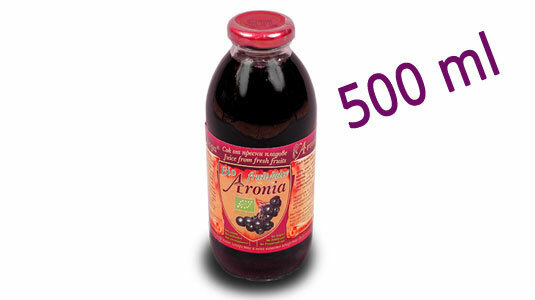 The juice is great mixed with other fruits and fruit juices! We are happy that we are able to offer this unique product – a gift from the unique Bulgarian nature.